Taille de cet aperçu : 413 × 599 pixels. Autres résolutions : 165 × 240 pixels | 331 × 480 pixels | 414 × 600 pixels | 911 × 1 321 pixels. 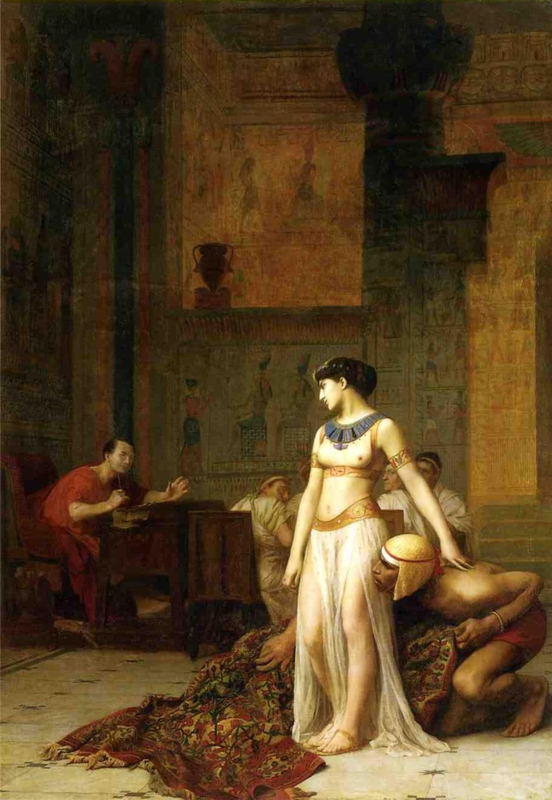 Notes Cleopatra Before Caesar by Jean-Léon Gérôme, oil on canvas, 1866. Cleopatra confronts Gaius Julius Caesar after emerging from a roll of carpet. The Egyptian Queen had been driven from the palace in Alexandria by her brother/husband Ptolemy XIII. She had to disguise herself to regain entry and treat with Caesar for protection and restoration of her throne. Dernière modification de cette page le 23 mai 2015 à 16:17.